Seventeen Mara Salvatrucha, or MS-13, gang members were charged on July 19 with a dozen murders and other violent crimes committed on Long Island. 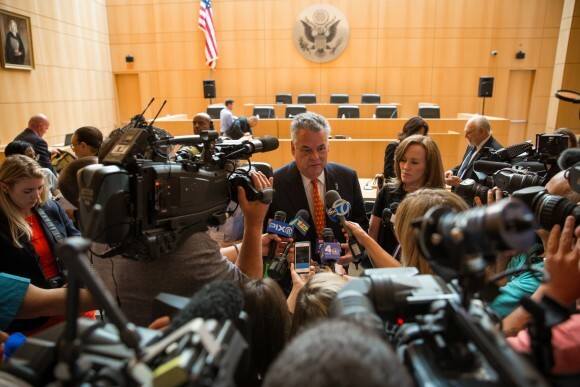 The indictment comes three months after the brutal slayings of four young men—Justin Llivicura, Michael Lopez, Jorge Tigre, and Jefferson Villalobos—in the Long Island town of Central Islip in April. On April 11, two female associates of MS-13 allegedly lured five young men to a wooded area in Central Islip, according to the Eastern District of New York in press release. Once there, the females texted their location to nearby MS-13 members. Alexis Hernandez, 20, Santos Leonel Ortiz-Flores, 19, Omar Antonio Villalta, 22, and the “other MS-13 members approached and surrounded the victims, and attacked and killed Llivicura, Lopez, Tigre and Villalobos using machetes, knives and wooden clubs,” the release said. The fifth victim escaped. 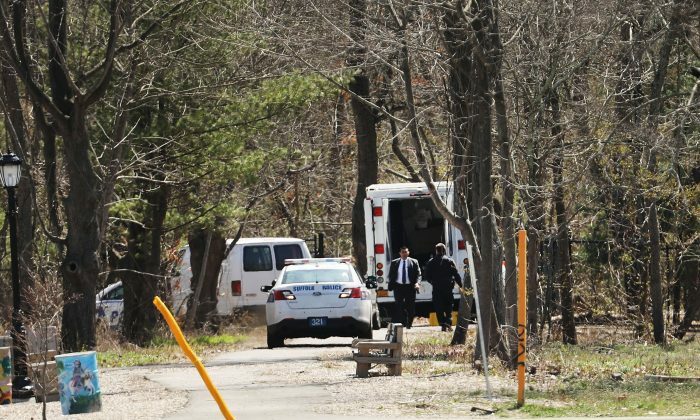 The MS-13 members and associates dragged the victims’ bodies to a more secluded spot and fled the scene, the Eastern District of New York said. The victims’ bodies were discovered the following evening, on April 12. William Sweeney, assistant director-in-charge of the FBI’s New York field office, said MS-13 is the agency’s number one priority on Long Island. MS-13 gang members have been charged with more than 40 murders in the Eastern District of New York since 2010. MS-13, a transnational criminal organization, has flourished in places like Suffolk County in the last several years. Although the gang formed in Los Angeles in the 1980s, it has deep ties to El Salvador—and, with an influx of unaccompanied minors from Central America resettling in Suffolk County, its violence has been escalating. Attorney General Jeff Sessions visited Long Island two weeks after the killings of the four men, specifically to bring federal attention and resources to the efforts on Long Island against MS-13. “We are committed to bringing violent criminals to justice, and this indictment is the next step in our mission of finding, prosecuting, and eradicating the MS-13 threat,” Sessions said in a press release on July 19. “The senseless murders charged in this superseding indictment further demonstrate MS-13’s compulsion to commit horrific acts of violence in communities in our district,” she said in a press release. The charges also include the Jan. 30 murder of Esteban Alvarado-Bonilla, a suspected rival gang member of MS-13, and the assault of an innocent bystander at a deli in Central Islip. A member of the MS-13 “Sailors” clique allegedly saw Alvarado-Bonilla inside the El Campesino Deli in Central Islip and reported the sighting to the clique leaders, according to the press release. The leaders then directed MS-13 members to kill Alvarado-Bonilla—which they did, allegedly shooting him multiple times, as well as assaulting a deli employee. The 17 MS-13 members arrested are charged with 59 counts including racketeering, 12 murders, attempted murders, assaults, obstruction of justice, arson, conspiracy to distribute marijuana, and related firearms and conspiracy charges.